The new Remote Hand Station enables safe and secure local monitoring and control of Rotork IQ3 actuators installed in inaccessible locations. 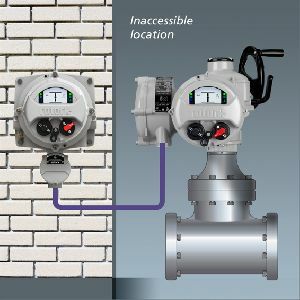 Rotork’s superior solution provides the user with an exact duplicate of the actuator’s own monitoring and control interface, at a distance of up to 100 metres from the valve. Power for the Remote Hand Station is supplied by the actuator, with which the unit shares all the benefits of the same IP68 double O-ring sealed environmental enclosure. There is no need for expensive cabling; standard comms wiring suitable for the operating environment is all that is required between the actuator and the Remote Hand Station. The user can remotely operate, interrogate and configure the actuator using the Rotork hand-held setting tool with its secure wireless Bluetooth® link. Retaining all of the actuator’s functionality, the Remote Hand Station presents an identical window into the process, showing diagnostic data including the valve torque and usage profiles along with service logs and facilitating real time analysis directly at the unit. Alternatively, information from the actuator datalogger can be downloaded and transferred to a PC for analysis using Rotork Insight2 diagnostic software to enable valve maintenance requirements to be identified and anticipated. Designed for wall or pole mounted installation, the Remote Hand Station will be available with explosionproof certification and can also be equipped with a vandal proof cover to prevent unauthorised interference.